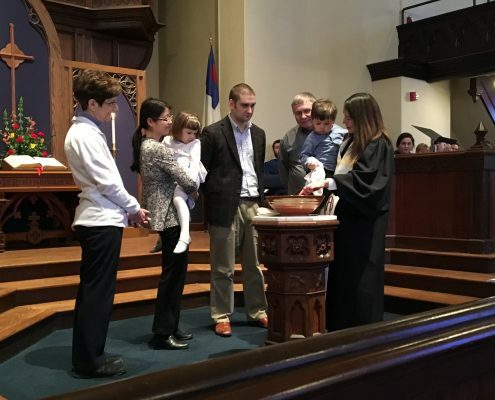 Parents holding their newborn child, or adults standing up in affirmation of their faith, share the joy of being welcomed into God’s inclusive family of love and community through the sacrament of baptism. Baptism is the act by which the Church declares God’s active and initiating love in each individual person’s life. In baptism, we proclaim that baptized persons have become a visible part of the wider community of Christ, that baptized persons are joined, by faith, to Jesus, our teacher, leader, and guide, and that God, through the presence of the Spirit, is always with us, wanting for our lives wholeness, fullness of life, and goodness. We would be honored to be the faith community for those individuals and families who desire to take this important step on their journey of faith. Please contact us if we can be of service to you.